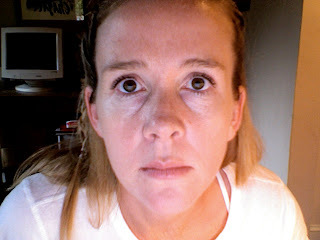 Here are the before and after pictures of my broadband light laser skin treatment. The first picture is before, the 2nd is after. These totally look like mugshots!! I wish I had a better camera or way to take a clearer picture, because the results are much more dramatic than they appear. I am SO happy with them, that even though it hurts like a mother, I would do it again. 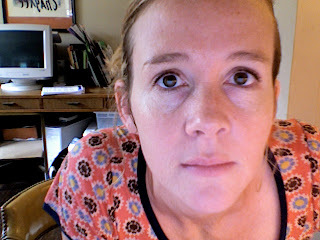 My skin is freckly and gets sun spots easy, so I was a good candidate. They put goggles on you (think tanning bed goggles), put a cool gel on your face, and the nurse stands to the side with a vacuum looking device that continually blows cold air while the doctor is treating you. Going into this, I had no clue this would hurt. I started to get worried when the doc told me that everyone jumps when the use the laser because of the sound and light that fills your sinuses (huh???!). She also told me to let her know if I needed a break, but it would only take 5 minutes or so. (uh oh, now I was really starting to panic). Let me preface the next part by saying I have a strong pain tolerance. I birthed two children and never complain about this or that hurting. Giving blood is no big deal. I couldnt even feel the botox injections I got. However, I was not prepared for the BURN sensation. No topical anesthetic was used. They turn the laser on and off all over your face. It snaps really loud and shoots the laser on your skin. It feels like a match is being held to your face. They do this a million times all over your face. It hurts. Me no likey the feeling of my skin being burned off. It is not warm, or even hot, it is a burn! OUCH! If I shell out another $350 some day to do it again, I will definitely being seeking a topical anesthetic to help a bit. Or a few pre treatment cocktails might take the edge off. The spots on your face immediately turn very dark brown. They last up to 2 weeks and then fall off, leaving nice skin. My face looked like it was dirty or just super freckly for about a week, then they all fell off. Has anyone else ever had a laser skin treatment? What was it like and were you happy with the results? Hmmm... I'm thinking of doing this, but you just reminded me that I am scared sh*tless of the pain. I'll have to check into that topical anesthetic first. It looks great though! I LOVE LOVE LOVE the results. It is hard to tell from my picture, but my face looks SO much better. i love your eyes but thats besides the point! i think you look great i did this too and i think its worth the pain i'm also getting laser hair removal and it hurts too but so far i've done 3 parts of my body, i'm willing to hurt a bit once in a while, i think we all are ha! congrats DD! Results seems to be fair enough and I hope it is as good treating staph skin infections as well which has become a major concern these days. I just had this done yesterday but my doctor gave me a topical anesthetic first. My face was pretty numb and it still hurt! Can't imagine doing this without some pain relief. Honestly, I think everyone should insist on a topical from your doctor before doing this. (There is no reason why this should hurt so much. A topical is no big deal.) The "mild stinging sensation" wasn't mild at all! Next time I will pop some Advil or Aleve before going to take the edge off. Thanks for letting me know about the brown spots. They were unexpected and I didn't know what they meant. Looking forward to the results! OMG !! I totally just got this done today.. It was so painfull even with the anesthetic! My face was super red for about 2 hours. Now it looks like I have super dark purple freckles, even where I never had them before. I was told to expect this and they will fall off in 4 days.. Ewwww! Just got this done today and it hurt like HELL. I dont' know if I can do it again seriously.. I am going to call the office about a topical anestetic? I had my first treatment yesterday. Although I have a low tolerance for pain, it did not hurt. Also, my spots are not a bit darker. They used level 14. As I do not wish to pay for more treatments than necessary, do you know what level they used on your face? I just had this done 4 days ago. I did have a topical anestetic and mine did not hurt at all it felt like little snaps, comparable to a tiny pinch. I have to agree I wasn't expecting the burning smell and it great to hear that my polked-dot skin will fall off. It gets better everyday but you do get a little parnoid that it may stay that way! :) The new skin that is surfacing does look really nice, can't wait til I'm completely back to normal! Would you like to to get rid of your unwanted hair? It is safe to say that they are limiting you from looking beautyful? Assuming this is the case, then it is proposed to visitdiode laser hair removal in delhi andlaser hair removal in delhi. The first time I did it the clinic did not offer an anesthetic cream with at least 8% of the main ingredient lidocaine. Thanks for sharing this valuable informative about "Results of Skin Treatment". Its really useful for me.